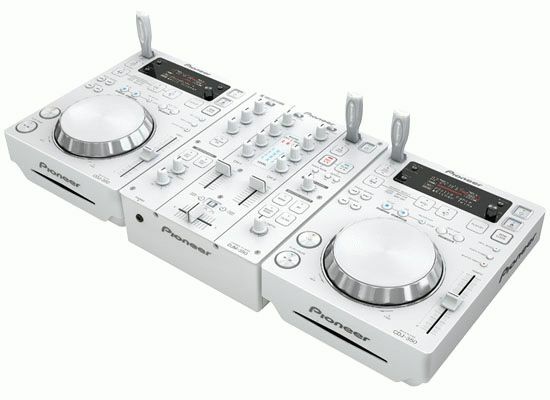 Pioneer Electronics (USA) Inc. Professional Sound and Visual Division today introduced a new pearl white version of its entry-level DJ system comprising of two CDJ-350-W digital media players and a DJM-350-W 2-channel mixer. As the popularity of music remixing increases, Pioneer continues to offer consumers the best way to engage in the art by offering innovative and fashionable DJ gear. The new pearl white CDJ-350-W and DJM-350-W models not only add a fashion statement to DJ performances but also offer two additional audio effects - Noise and Short Echo. “Offering our gear in more colors than the traditional black is generating new excitement within the DJ community. The HDJ-500 entry level headphones we introduced several months ago are now available in three colors, and are creating a lot of buzz with DJs. We are looking forward to the same reaction with the new pearl white version of the CDJ-350 and DJM-350s,” said David Arevalo, senior marketing manager, Professional Sound and Visual Division for Pioneer Electronics (USA) Inc. The CDJ-350-W will allow users to create DJ performances with various digital music files, including MP3, AAC, WAV and AIFF files that are stored on different forms of media, including USB mass storage device class products*1 and CD-R/RW discs. The media player also includes Pioneer’s proprietary music management software, rekordbox™, which analyzes and categorizes music by genre, making it possible to easily manage music files on a computer for quick song selection when played back on compatible Pioneer players. Connecting a USB storage device loaded with playlists created with the software allows users to choose songs by various criteria such as genre, album name, artist name, etc. for stress-free DJ performances. Music sessions can also be saved to a USB storage device and then saved in rekordbox as an original playlist. BEAT Display Function – Visually illustrates the beat position of a song and the playback point providing easier hand-eye coordination when performing scratches and loops. Auto BPM Lock – Users can set a Master Beat Per Minute (BPM) of the current song playing that can be synchronized with a touch of a button. The feature enables beginners to easily match the tempos of songs by simply adjusting the speed to the Master BPM on each player. Create Playlist Function – While a song is playing, users can immediately add it to a new playlist with a touch of a button for future playback of favorite songs. DJ Software Compatible – The CDJ-350-W is MIDI-compatible with other DJ software allowing it to be used as an audio interface. Vibration resistant by utilizing Shock-Proof Memory3 and Floating Architecture. Four level tempo settings*3 for maximum variation range of a song's tempo (±6%, ±10%, ±16% and WIDE). Resume function enables users to remove a disc and resume playback at the same spot when the disc is reloaded. Environment-friendly auto standby feature automatically detects operation status and signal input and puts the device in standby mode when the player is not engaged for set periods of time. Users can set the time value or can defeat the feature altogether. The DJM-350-W mixer inherits similar functions and operability of the popular Pioneer DJM series of mixers often experienced in the club scene. With its new pearl white makeover, the built-in level meter’s red, white and blue LEDs create a stunning appearance. The mixer is equipped with four sound effects including the newly added Noise and Short Echo, as well as an isolated 3-band equalizer—all of which allow the DJ to make one-of-a-kind mixes. The Type A USB port on the front top panel allow users to record their DJ mixes onto a USB storage device, review their mix and take it with them to listen to on other devices. Digital Conversion - Analog signals are converted into digital form via a high-performance CPU for higher fidelity sound. In addition, analog and digital circuits are isolated to minimize induced noise. P-LOCK Fader Cap keeps the fader knob (caps) from slipping off, especially during intense DJ sessions. MIC/AUX input terminals for connecting portable audio players and/or microphones. A connected Pioneer CDJ player can triggered to fader, start or play functions via a link to the fader control. Peak level meters indicate the input levels of each channel. Crossfader Curve Adjustment function makes it possible to have three crossover curve patterns. Pioneer’s packaged pearl white DJ system will be available in January 2011 and come with two CDJ-350-W players and one DJM-350-W mixer for a suggested retail price of $2,445.